Carrie from Frugal Foodie Mama is back this week with another mouth watering recipe using produce she picked up at the market! Be sure to make your list, check it twice, and pick up all you need for this delicious meal on Sunday! If you visit the Bridgeport Farmers Market on any given Sunday during their outdoor season, you are sure to find at least 20 different local farmers selling their freshly picked vegetables and pasture raised eggs & meats from baskets and coolers at various tables throughout the market. I am on a mission once again during this outdoor farmers market season to show you how you can create a delicious meal purchasing mostly locally grown & raised produce and meats at the market this summer. Each month I will be sharing a recipe to the Bridgeport Farmers Market blog inspired by and featuring some of my favorite fresh & local finds from the market. For the month of August, I am sharing the recipe for these Summer Veggie Stuffed Poblano Peppers. 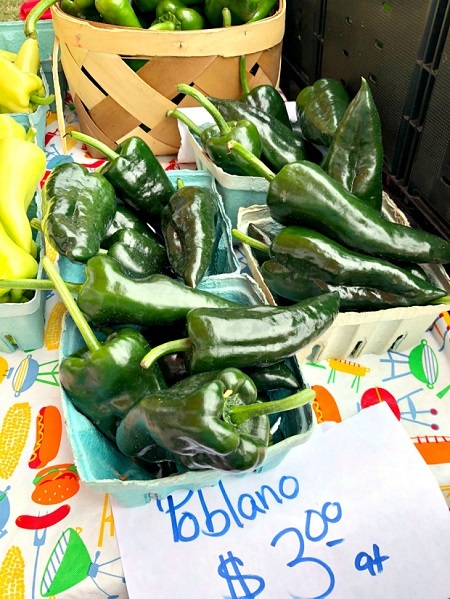 I spotted some gorgeous poblano peppers at the market on one of the tables at Green Acres Farm, and I knew I had use them in my next recipe for the farmers market blog. Poblanos happen to be perfect for stuffing, & what better to stuff them than with a bunch of fresh veggies from the other farmers at the market? but you could certainly switch out or leave out any of these veggies to suit your personal preferences. You could finely chop kale or spinach & add it to the stuffing. Or try a different squash like butternut or patty pan instead of the summer squash. You could easily swap in quinoa or brown rice for the Basmati rice in this as well. Top the stuffed peppers with your favorite shredded cheese during the last 10 minutes of baking for a little cheesy goodness. 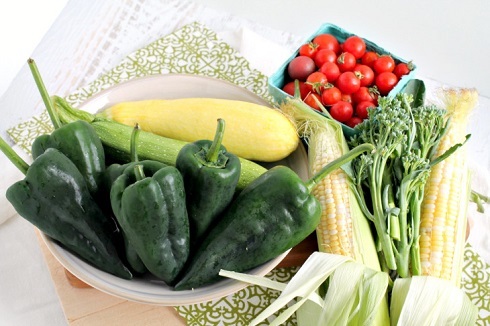 This month’s recipe features poblano peppers, zucchini, & summer squash from Green Acres Farm, ambrosia corn & broccolini from WV Briarpatch, and cherry tomatoes from Richardsons Farm. Be sure to stop by their tables during your next visit to the Bridgeport Farmers Market, & tell them I sent you. Preheat your oven to 375 degrees. Spray the inside of a large baking pan with cooking spray. Set aside. In a large skillet, heat the olive oil over medium-high heat. Add in the garlic, & saute for 1 minute. Then add in the zucchini, squash, corn, & broccolini. Saute another 3-4 minutes. Add in the basil, cherry tomatoes, & cooked rice. Cook for an additional 2 minutes. Scoop the veggie/rice mixture evenly into each poblano pepper half. 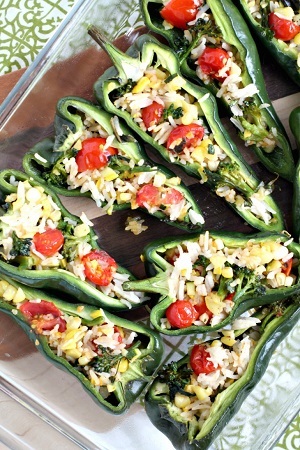 Arrange the stuffed poblano peppers into the prepared baking dish as you fill them. Once you have stuffed all the pepper halves & placed them in the baking dish, cover the pan tightly with aluminum foil. Bake at 375 degrees for 30 minutes or until the peppers are fork tender.